Led Zeppelin combining the visceral power and intensity of hard rock with the finesse and delicacy of British folk music, redefined rock in the Seventies and for all time. They were as influential in that decade as the Beatles were in the prior one. Their impact extends to classic and alternative rockers alike. 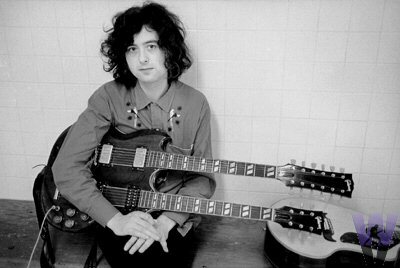 Jimmy and the "double neck"
Led Zeppelin was born as the psychedelic trend setting Yardbirds crashed and burned in 1968. Jeff Beck, Eric Clapton, Jim McCarty, Keith Relf, and Paul Samwell Smith left the Yardbirds for various reasons, from Beck's nervous exhaustion to Relf and McCarty's discontent with the band's musical direction. Jimmy Page, a relative newcomer to the band in 1966 and the original Chris Dreja found themselves owning the band's name and obligated to fulfill the Yardbirds remaining concert engagements without a band. Page went looking for a new vocalist, and wanted to get B.J. Wilson of Harum and Terry Reid, but neither could help him. Reid suggested to Page that he enlist Robert Plant. Page did so, the same month that Dreja decided to drop out of the band as well. Page had been jamming with John Paul Jones, who asked to be a part of any future projects of Page's. He became the bassist for the band to replace Dreja. Plant recommended John Bonham, as they had worked together in one of Plant's old bands. He had to be persuaded to join the group, but he did eventually join after a month of convincing. Page dubbed the re-formed band "The New Yardbirds." In late September of 1968, The New Yardbirds fulfilled the last of the obligations of the old band, and in October recorded their first album in an astonishing 30 hours. They also changed their name to Led Zeppelin, after being told by friend Keith Moon of The Who that they would go over "like a lead balloon." Before the end of the year they were signed with Atlantic Records and touring soon afterwards. Their album was released and in two months had reached the Top Ten. They toured continuously through 1969, recording their second album, Led Zeppelin II, while on tour. It was released that October and hit Number One in two months, spending seven weeks at that spot. This album propelled them to international fame and they continued to tour. Both of their first albums showed a heavy blues influence; it was so heavy that it turned out they had only changed the words of two Willie Dixon songs slightly, and were sued by Dixon fifteen years later. Led Zeppelin had to give proper credit and a monetary settlement to resolve the matter. A year after the release of their second album, Led Zeppelin released their third album, Led Zeppelin III, which started to show a heavy influence of British folk music, Celtic music, and mysticism. During this time they slowed the pace of their touring down considerably. Led Zeppelin's interest in folk music and mythology grew, and this interest was evident on their fourth album, released in late 1971. Although it was untitled, it is commonly referred to as Led Zeppelin IV. Featuring the mystical, Battle of Evermore, Black Dog, and the now-classic Stairway to Heaven. This album was their most diverse yet. The album never reached number one, but it was their biggest seller, and Stairway to Heaven was a quick radio hit and eventually became a legendary classic rock ballad, (generally regarded as the greatest song in classic rock music), despite their refusal to release any of their songs as singles. After some much less frantic touring in 1972 Led Zeppelin settled down to record their fifth album. This album, titled Houses of the Holy, broke their usual naming convention, but it did not break their tradition of experimentation, integrating reggae and funk sounds with the folk, rock, and blues that had made them so popular. This album was released in 1973, and the subsequent tour broke box-office records all over the United States. In 1975 the band released their first album on their personal record label, Swan Song. This album was Physical Graffiti, a double album, which immediately topped the charts in both the States and England. Led Zeppelin launched a tour that year, but it was quickly cut short when Plant and his wife were injured in a car crash. In 1976 they returned to the scene again with a new album, Presence and The Song Remains the Same, a live concert film. Despite the album's debut at number one, reception for both was unimpressive. In 1977 they returned to touring, only again to have it cut short by another tragedy - this time, Plant's son Karac died of a stomach infection. With no information about their plans and Plant withdrawn into seclusion, speculation about the band's future was rampant. Late into 1978 Led Zeppelin returned to recording, and In Through the Out Door was released in late 1979. During that time the band performed two performances in England. The album debuted at number one again, and in 1980 they launched their European tour. In September of that year, they retired to Page's residence to prepare for their American tour - which never happened. On September 25th, Bonham was found dead of asphyxiation after a drinking binge the day before. The remaining members of Led Zeppelin felt that they couldn't continue without their drummer, and parted ways. Despite the sad end to the band, it has lived on through the release of Coda, a collection of outtakes and boxed sets released two years after Bonham's death. Plant and Page have reunited a few times since, for Live Aid in 1985, Atlantic Record's 40th anniversary in 1988, and MTV Unplugged in 1994. The band continues to influence many musicians to this day, often lending its famous riffs to hip-hop artists, showing how widely varied and innovative the classic rock Led Zeppelin made really was. Led Zeppelin, more than any other band, incorporated the blues, mysticism, and British folk into their heavy metal sound. The group's commercial success is nothing short of phenominal (over 106 million albums sold in the USA). Led Zeppelin are now recognized as one of the most influential bands of the classic rock era and their catalogue continues to provide inspiration to new generations of hopeful musicians.